"The key to making your students' learning experiences worthwhile is to focus your planning on major instructional goals, phrased in terms of desired student outcomes—the knowledge, skills, attitudes, values, and dispositions that you want to develop in your students. Goals, not content coverage or learning processes, provide the rationale for curriculum and instruction." Imagine that you had to go to a city you haven't visited before. You know that cities have a variety of services and attractions, but you don't know exactly what you are supposed to do in this particular city. Should you provide a service for someone, gather information about a particular person or place, or do something else? Without a specific objective, you could spend your time on something that isn't important or that makes it difficult to know whether your time in the city was worth the trip. Being in a classroom without knowing the direction for learning is similar to taking a purposeless trip to an unfamiliar city. Teachers can set objectives to ensure that students' journeys with learning are purposeful. When teachers identify and communicate clear learning objectives, they send the message that there is a focus for the learning activities to come. This reassures students that there is a reason for learning and provides teachers with a focal point for planning instruction. Providing feedback specific to learning objectives helps students improve their performance and solidify their understanding. Setting objectives and providing feedback work in tandem. Teachers need to identify success criteria for learning objectives so students know when they have achieved those objectives (Hattie & Timperley, 2007). Similarly, feedback should be provided for tasks that are related to the learning objectives; this way, students understand the purpose of the work they are asked to do, build a coherent understanding of a content domain, and develop high levels of skill in a specific domain. In this chapter, we present classroom practices for setting objectives and providing feedback that reassure students that their teacher is focused on helping them succeed. Setting objectives is the process of establishing a direction to guide learning (Pintrich & Schunk, 2002). When teachers communicate objectives for student learning, students can see more easily the connections between what they are doing in class and what they are supposed to learn. They can gauge their starting point in relation to the learning objectives and determine what they need to pay attention to and where they might need help from the teacher or others. This clarity helps decrease anxiety about their ability to succeed. In addition, students build intrinsic motivation when they set personal learning objectives. Providing feedback is an ongoing process in which teachers communicate information to students that helps them better understand what they are to learn, what high-quality performance looks like, and what changes are necessary to improve their learning (Hattie & Timperley, 2007; Shute, 2008). Feedback provides information that helps learners confirm, refine, or restructure various kinds of knowledge, strategies, and beliefs that are related to the learning objectives (Hattie & Timperley, 2007). When feedback provides explicit guidance that helps students adjust their learning (e.g., "Can you think of another way to approach this task? "), there is a greater impact on achievement, students are more likely to take risks with their learning, and they are more likely to keep trying until they succeed (Brookhart, 2008; Hattie & Timperley, 2007; Shute, 2008). The results from McREL's 2010 study indicate that the strategies of setting objectives and providing feedback have positive impacts on student achievement. The 2010 study provides separate effect sizes for setting objectives (0.31) and providing feedback (0.76). These translate to percentile gains of 12 points and 28 points, respectively. The first edition of this book reported a combined effect size of 0.61, or a percentile gain of 23 points, for this category. Differences in effect sizes may reflect the different methodologies used in the two studies, as well as the smaller study sample size (four studies related to setting objectives; five studies related to providing feedback) and the specific definitions used in the 2010 study to describe the two strategies. Studies related to setting objectives emphasize the importance of supporting students as they self-select learning targets, self-monitor their progress, and self-assess their development (Glaser & Brunstein, 2007; Mooney, Ryan, Uhing, Reid, & Epstein, 2005). For example, in the Glaser and Brunstein study (2007), 4th grade students who received instruction in writing strategies and self-regulation strategies (e.g., goal setting, self-assessment, and strategy monitoring) were better able to use their knowledge when planning and revising a story, and they wrote stories that were more complete and of higher quality than the stories of control students and students who received only strategy instruction. In addition, they retained the level of performance they reached at the post-test over time, and when asked to recall parts of an orally presented story, the strategy plus self-regulation students scored higher on the written recall measure than did students in the other two groups. The studies related to feedback underscore the importance of providing feedback that is instructive, timely, referenced to the actual task, and focused on what is correct and what to do next (Hattie & Timperley, 2007; Shute, 2008). They also address the use of attributional and metacognitive feedback. For example, a study by Kramarski and Zeichner (2001) investigated the use of metacognitive feedback versus results feedback in a 6th grade mathematics class as a way to help students know what to do to improve their performance. Metacognitive feedback was provided by asking questions that served as cues about the content and structure of the problem and ways to solve it. Results feedback provided cues related to the final outcome of the problem. Students who received metacognitive feedback significantly outperformed students who received results feedback, in terms of mathematical achievement and the ability to provide mathematical explanations. They were more likely to provide explanations of their mathematical reasoning, and those explanations were robust—they included both algebraic rules and verbal arguments. At a minimum, setting objectives involves clearly communicating what students are to learn. 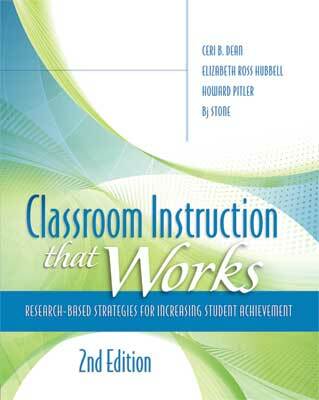 The classroom practices presented in this chapter emphasize that there are additional actions teachers should take to maximize this strategy's potential for improving student achievement. Communicate the learning objectives to students and parents. Connect the learning objectives to previous and future learning. Standard: Use the general skills and strategies of the writing process. Benchmark: Write informative/explanatory text to examine a topic and convey ideas and information clearly. In this example, the standard is written at a very general level. The benchmark statement is more specific and could serve as the learning objective for a unit or portion of a unit. Notice that the benchmark provides detail about what the student must be able to do (write informative/explanatory text) and for what purpose (to examine a topic and convey ideas and information clearly). To identify learning objectives for individual lessons, the teacher might begin by asking the question "What does it mean for students to write informative/ explanatory text to examine a topic and convey ideas and information clearly?" By answering this question, the teacher can determine what students must know, understand, and be able to do. Generating the topic, instead of receiving the topic from the teacher. Understanding the procedure for writing a complete paragraph. Demonstrating the ability to write a complete paragraph that includes an introductory sentence, supporting sentences, and a concluding sentence, without the aid of sentence starters or similar assistance. Demonstrating the ability to establish and maintain coherence throughout a paragraph by aligning sentences with one another and to the topic. The teacher uses the knowledge and skills identified through the unpacking process to develop lesson objectives. These objectives explicitly focus instruction on guiding students toward proficiency with the content knowledge and skills expressed in the standards document. Learning objectives should not be so broad that they are meaningless or so narrow that they limit learning or provide few opportunities for differentiation. Figure 1.1 presents examples of learning objectives that are too general, too specific, and appropriately specific. To provide the guidance that students need, learning objectives should be stated in terms of what students are supposed to learn, not what activity or assignment they are expected to complete. For example, "Understand how white settlers interacted with American Indians" is a learning objective, and "Read pages 14–17 and answer the questions about ways that white settlers interacted with American Indians" is a learning activity. The learning objective is what students should know, understand, or be able to do as a result of completing the learning activity or assignment. Stating learning objectives as statements of knowledge underscores the point that attaining objectives is about acquiring knowledge rather than competing against others (Brophy, 2004). Understand the fundamental concepts of growth and development. Describe the function of the respiratory system in three sentences. Identify basic human body systems and their functions. Use movement concepts and principles in the development of motor skills. Explain how the principle of overload applies to training for a basketball competition, including at least five details in your explanation. Apply the physiological principles that govern, maintain, and improve motor skills. Use the process of science inquiry. Describe three observations about how bean plants grow, using four pictures and at least four numbers. Record and describe observations with pictures, numbers, or words. It is important to communicate learning objectives to students explicitly by stating them verbally, displaying them in writing, and calling attention to them throughout a unit or lesson. Clearly stating the learning objectives in student-friendly language helps students focus on what you want them to learn. Communicating learning objectives to parents helps them understand and become engaged in what their children are learning. When thus informed, parents can then ask their children specific questions, such as "What did you learn today about safety rules in the home and school?" or "What's the most interesting thing about the different states of matter?" Providing multiple options—blogs, text messages, e-mails, letters—for parents to access information about learning objectives sends the message that you value their involvement. Administrators at a school in Saipan are experiencing some difficulty as they attempt to identify learning objectives during their regular classroom walkthroughs. They suppose that if they are having a difficult time, then students might be experiencing a similar frustration. After teachers understand the administrators' concerns, they decide to denote an area on the classroom boards where the objective can always be found. Each teacher sections off a square of his or her board and then divides the square into two columns. In the left column, teachers write the learning objectives. In the right column, they write the learning activity that the class will focus on during each day or period. Now, anyone who enters the classroom—students, visitors, or administrators—can quickly find the objective and know exactly what is happening each day. Many teachers now use social media to communicate learning objectives to audiences outside the classroom. For example, a teacher might post weekly objectives on his or her class blog or wiki. Tools such as blogs, websites, and social media pages allow parents to have immediate and accurate access to what is happening in the classroom. Teachers should explain how learning objectives connect with previous lessons or units or with the larger picture of a particular unit or course (Brophy, 2004; Urdan, 2004). Although most teachers do this naturally, this recommendation is meant to ensure that educators explicitly call students' attention to how the current learning objective is connected to something they have already learned and how they will apply what they are learning now to future studies. Mr. Jackson, a 4th grade mathematics teacher, wants to be sure his students understand the connections between what they are doing in a given day's lesson and previous lessons on the same topic. He tells his students, "We've been learning how to add and subtract fractions with like denominators. Today, we're going to apply that knowledge and what we learned about writing equivalent fractions to add fractions with unlike denominators. Eventually, you will be able to apply this knowledge to a cooking activity in which you will combine ingredients to make a Fall Festival cake." This practice helps Mr. Jackson's students build a more complete mental image of the topic being studied, and it encourages them to commit to the learning objectives. Providing opportunities for students to personalize the learning objectives identified by the teacher can increase their motivation for learning (Brophy, 2004; Morgan, 1985; Page-Voth & Graham, 1999). Students feel a greater sense of control over what they learn when they can identify how the learning is relevant to them. In addition, this practice helps students develop self-regulation (Bransford, Brown, & Cocking, 2000). Students who are skilled at self-regulation are able to consciously set goals for their learning and monitor their understanding and progress as they engage in a task. They also can plan appropriately, identify and use necessary resources, respond appropriately to feedback, and evaluate the effectiveness of their actions. Acquiring these skills helps students become independent lifelong learners. Providing them with sentence stems such as "I know that … but I want to know more about … " and "I want to know if … " Younger students can write "I can" or "I will" statements. Asking them to complete a K-W-L chart as a way to record what they know (K) about the topic, what they want (W) to know as a result of the unit or lesson, and what they learned (L) as a result of the unit or lesson (Ogle, 1986). Students can complete the L section throughout the unit or lesson. Adding a column labeled "What I Think I Know" reduces stress about being correct and expands students' thinking. Checking their learning objectives to ensure they are meaningful and attainable within the given time period and with available resources. If students do not have enough prior knowledge to set personal learning objectives at the beginning of a unit, delay this task until they have engaged in some of the unit's learning activities. If students struggle with setting personal learning objectives, ask them to talk to a few other students to gather some ideas, or provide some examples and invite them to select one of them. Studies have shown that "contracts" can have positive effects on students' ability to set objectives for their learning (Brophy, 2004; Greenwood, 2002; Kahle & Kelly, 1994; Miller & Kelley, 1994; Tomlinson, 2001). These contracts provide students with control over their learning and provide opportunities for teachers to differentiate instruction to better accommodate students' learning needs (Tomlinson, 1995). As illustrated in Figure 1.2, contracts can include teacher-identified or student-identified learning objectives. They can take the form of a learning plan that provides options for the kinds of activities students do on particular days and at specific times. In addition, they also provide students with guidance about what they need to accomplish, help students organize their time, and provide ongoing opportunities for students to seek or provide their own feedback. In this example, elementary students are learning about Earth's cycles. Specifically, they are working on the learning objective "Knows how features on the Earth's surface are constantly changed by a combination of slow and rapid processes (e.g., slow processes, such as weathering, erosion, transport, and deposition of sediment caused by waves, wind, water, and ice; rapid processes, such as landslides, volcanic eruptions, and earthquakes." As shown by Figure 1.2, this student wants to know why some changes on Earth happen steadily, whereas others happen irregularly. He plans to research this information by watching a few online streaming videos recommended by his teacher and by conducting targeted Internet searches. Explain changes in the real world using a model. Know that changes are steady or irregular. Know that some changes are repetitive. I want to know why some changes are steady and some are irregular. Find information on the Internet. By providing students with feedback that is corrective, timely, and focused on criteria, and by involving them in the feedback process, teachers can create a classroom environment that fosters and supports learning. The classroom practices featured in this chapter emphasize that the goal of providing feedback is to give students information about their performance relative to a particular learning objective so they can improve their performance and understand themselves better as learners. Provide feedback that addresses what is correct and elaborates on what students need to do next. Provide feedback appropriately in time to meet students' needs. Provide feedback that is criterion referenced. Engage students in the feedback process. This practice underscores the link between learning objectives and feedback. Providing specific feedback that helps students know how to improve their performance requires teachers to identify and understand the learning objectives (Stiggins, 2001). If teachers do not understand the learning objectives, it is difficult for them to provide students with information about what good performance or high-quality work looks like. Feedback should help students understand what was correct as well as contain specifics about what was incorrect. If a student's performance falls short because he or she is operating from faulty interpretations or hypotheses, feedback should make this clear (Hattie & Timperley, 2007). For example, if students assume that seasons are due to Earth's distance from the sun, the teacher's feedback should include information that helps students understand that seasons are a consequence of Earth's tilt. Providing this kind of information helps students fill in missing information and clarify misunderstandings. Effective feedback should also provide information about how close students come to meeting the criterion and details about what they need to do to attain the next level of performance (Shirbagi, 2007; Shute, 2008) Teachers can provide elaboration in the form of worked examples, questions, or prompts—such as "What's this problem all about? "—or as information about the correct answer (Kramarski & Zeichner, 2001; Shute, 2008). Mrs. Wang is working individually with Sophia, a student struggling with writing a persuasive essay. Sophia is passionate about her views of reducing waste and recycling, yet her current essay comes across as "ranting" without much information to back up her views. As they work through the essay, Mrs. Wang's feedback commends Sophia's enthusiasm for her topic and helps her rewrite the essay as a call to action rather than as a diatribe. At the end of the session, Mrs. Wang says to Sophia, "I think our next step is to show readers what first intrigued you to take action. You mention that you saw a video about the amount of waste going to landfills. Perhaps we could find some exact numbers about how much trash we produce. That would help readers understand your passion for creating change." In this way, Mrs. Wang gives specific and helpful feedback to Sophia, and she also guides her student to future steps that are needed. As in many other areas of life, timing is everything (or at least important) when giving feedback. Recent research indicates that the timing of feedback depends to some extent on the nature of the task and on whether students are high performing or low performing (Shute, 2008). When students are engrossed in figuring out a difficult task, feedback should be delayed; however, when students can use feedback to complete a task, immediacy helps. Providing immediate feedback can encourage students to practice, and it helps them make connections between what they do and the results they achieve. Delaying feedback may encourage development of cognitive and metacognitive processing for high-performing students, yet it may cause frustration for struggling and less-motivated students (Clariana & Koul, 2006; Shute, 2008). Further, some studies indicate that students may benefit from delayed feedback when they are learning concepts and from immediate feedback when they are acquiring procedural skills (Franzke, Kintsch, Caccamise, Johnson, & Dooley, 2005; Mathan & Koedinger, 2002; Shute, 2008). Zach, a 3rd grader, is working on his multiplication facts. His teacher provides multiple activities that are fun and motivating and that give Zach timely feedback on his progress. Several times during the week, Zach is given 15 minutes to perform multiplication problems via computer games, board games, or flash cards. Each session gives him immediate feedback on whether his answers are correct (and if he is not, the correct answer is provided). At the end of the week, Zach takes a timed quiz. His teacher grades the quiz during lunch and then returns it to Zach so he can record the time and score on a chart he has been keeping. This timely feedback and tracking experience help Zach see how he is progressing in his attempt to master this particular skill. Feedback should address the knowledge that students are supposed to learn and provide information that helps them know what needs to be done to improve their performance. Obviously, feedback shouldn't be personal ("You're smart"), but, rather, it should address performance on a task and provide specific guidance for improvement ("Your response lacks details and includes some inaccurate information. Check the facts about this event, and add details to describe the reasons the event occurred."). One approach to providing criterion-referenced feedback is to use a rubric. A rubric is a scoring guide that describes levels of performance for a particular skill or concept. The number of levels included in a rubric can vary, but there should be at least one level beyond the level designated as "acceptable" or "proficient" performance. Rubrics that relate to information-type knowledge (vocabulary terms, facts, details, generalizations, principles, concepts) focus on the extent of understanding of the information. They might include criteria related to the level of detail students know or the completeness and accuracy of understanding. Rubrics for skill- or process-type knowledge (adding fractions, reading, writing) focus on whether students can perform the skill or process without error and with fluency. Teachers should provide examples of work at each level of performance to help students better understand what high-quality work looks like. Figure 1.3 provides examples of general rubrics for information and skills/processes. Teachers can adapt these rubrics for specific content, skills, and processes. For more information about developing rubrics, see Classroom Assessment for Student Learning: Doing it Right—Using it Well (Stiggins, Arter, Chappuis, & Chappuis, 2006). Mrs. McWherter, a 6th grade language arts teacher, is working with her students on writing biographies. She and Mr. Thompson, the social studies teacher, combine efforts as their students learn about heroes of the American Revolution. Students are supposed to not only research a hero or heroine of their choice but also use what they learn to write a biography of that person. In Mrs. McWherter's class, students go through the criteria of what constitutes an informative and engaging biography. In Mr. Thompson's class, students go through the process of gathering information about an appropriate hero. In this way, students use rubrics pertaining to both procedural and declarative knowledge, which helps them address all components of the project. The student has a complete and detailed understanding of the information important to the topic. The student has a complete understanding of the information important to the topic but not in great detail. The student has an incomplete understanding of the topic and/or misconceptions about some of the information. The student understands very little about the topic or has misconceptions about most of the information. No judgment can be made about the student's understanding of the topic. The student can perform the skill or process important to the topic with no significant errors and with fluency. In addition, the student understands the key features of the process. The student can perform the skill or process important to the topic without making significant errors. The student makes some significant errors when performing the skill or process important to the topic but still accomplishes a rough approximation of the skill or process. The student makes so many errors in performing the skill or process important to the topic that he or she cannot actually perform the skill or process. No judgment can be made about the student's ability to perform the skill or process. Students can provide some of their own feedback and provide feedback to peers. Providing students with opportunities to reflect on their own performance and exchange feedback with peers can help them become lifelong learners (Glaser & Brunstein, 2007; Mooney et al., 2005). It is important to remember, however, that the purpose of peer feedback is for students to clarify for one another what was correct or incorrect about their responses. Students should not give one another grades or scores. Rather, they should serve as "reviewers" who help determine what might be lacking in their performance. Teachers can involve students in the feedback process by asking them to keep track of their performance as learning occurs during a unit or course. For example, students might graph their progress or write weekly journal entries (or learning blogs) that describe what they've learned and how well they've learned it. If students have not had much experience engaging in the feedback process, they will be more successful if you provide them with templates or protocols that structure their feedback and model the process, as in the example that follows. Mr. Carson is working with his 2nd grade students as they learn to write biographies. He wishes to begin incorporating a self- and peer-feedback component to his students' writing cycle. He begins by having a discussion about what type of feedback is helpful and feels rewarding versus the type of feedback that isn't very helpful or even feels discouraging. The class agrees that feedback such as "that's great" makes them feel good, but it really doesn't help them know what is correct and what needs to be corrected. They also agree that words need to be chosen carefully when giving feedback so that feelings aren't hurt. Mr. Carson then reviews with the class what they have learned about biographies. As he talks, he holds up several biographies that they've read together, and he reminds students of some of the details they read. Finally, he is ready to give his assignment: Each student should research a person that he or she admires and then write a short biographical paragraph about this person. Mr. Carson then hands out a rubric to each student and goes over the criteria for the paragraph. Finally, he provides students with a template that helps them reflect on their own learning and give and receive peer feedback. (see Downloadable Figure 1) By using this tool, Mr. Carson scaffolds the peer-feedback process for students and lays the groundwork for future collaborative projects. Providing opportunities for students to personalize their learning objectives helps them find relevant, real-world applications of what they are learning. By engaging students in setting personal learning objectives, teachers enable them to take control of their own learning, which increases their intrinsic motivation. The International Society for Technology in Education's (ISTE) National Educational Technology Standards (NETS) for students echo this motivational aspect of control in their standards for creativity and innovation (2007). Providing students with opportunities for self- and peer assessment speaks to these 21st century skills. By allocating time for students to reflect upon their own learning and to give and receive feedback from peers, we help them develop skills they will need throughout their K–12 years, in college, and in the workplace. The tools available now (e.g., survey tools, blogs, wikis) strongly amplify students' and teachers' abilities to access, collaborate, and get feedback on their work. Encouraging students to use the many resources available online and through social media and engage in the feedback process helps them become self-directed learners. Students could post their writing to a blog and solicit feedback, or they could create a rubric and ask peers to give feedback on their writing with an online form. Teachers could provide young students with a simple graphic organizer (see Figure 1.4) in which they assess their own work, ask for peer feedback, and receive feedback from the teacher. I will understand how the interactions of air masses, create fronts as they move across oceans and land, and how those fronts serve as areas for the development of thunderstorms, tornadoes, and hurricanes. When I looked at the rubric, I decided that I earned a 2 because I can explain how thunderstorms and tornadoes form, but I don't really understand what causes a tropical storm to become a hurricane. Your explanations all seemed accurate, except for the one on hurricanes. You seemed a little confused about how they got started and got bigger. You earned a 2.5 on the rubric. You provided an accurate explanation of how thunderstorms and tornadoes form, but your explanation about the difference between tropical storms and hurricanes was inaccurate and included only a few specific details. Blogs and tools such as VoiceThread, which provide platforms for asynchronous, two-way communication, are excellent ways for students to provide feedback. During their early experiences with peer feedback, students often receive the most benefit if they use protocols that structure their feedback so it is meaningful and constructive. For examples of protocols that can be used in their current forms or modified for student use, see the Reciprocal Revision lesson plan from www.ReadWriteThink.org or any of the resources available on the National School Reform Faculty website (www.nsrfharmony.org). When this type of open feedback and sharing becomes the norm, students learn key habits that will help them become self-directed teachers and learners. State learning objectives in simple language and in terms of knowledge rather than learning activities. Relate the learning objectives to things that are personally relevant to students. Model for students how to set their own learning objectives and provide feedback on the learning objectives that they set. Periodically check student understanding of the learning objectives (e.g., ask them to write in their journals or on notecards about their understanding of the learning objectives). Select content sources, discussion questions, activities, assignments, and assessment methods according to how well they help students achieve learning objectives. Provide students with information about what good performance or high-quality work looks like well before an assessment. Provide students with feedback as soon after the event as possible and throughout a unit of instruction—not just at the end of a unit. After providing students with feedback about what they did correctly and what they need to do to improve performance, provide opportunities for them to continue working on the task until they succeed. Consider using technology to increase the rate of feedback, help organize it, and document it for further reflection. Copyright © 2012 by McREL. All rights reserved. No part of this publication—including the drawings, graphs, illustrations, or chapters, except for brief quotations in critical reviews or articles—may be reproduced or transmitted in any form or by any means, electronic or mechanical, including photocopy, recording, or any information storage and retrieval system.